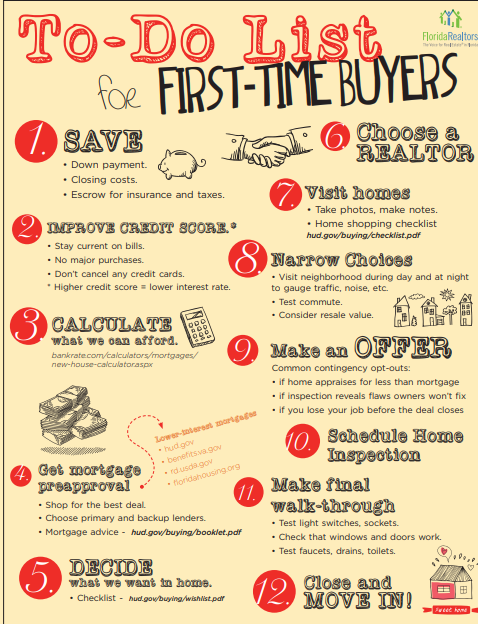 What do first time home buyers need? You have decided you are ready to start looking into purchasing your first home. Believe it or not, there are a few things that you need to get in order prior to shopping for your new home. First, lets make sure you have saved up enough money for your new purchase. I suggest making sure you have at least 20% for a down payment. If you are looking at a home that costs $200,000 you will need to save about $40,000.00 for your down payment. You will also need to take into account taxes, closing costs, escrow deposits, inspections, and I always recommend having a minimum of 2 months cash reserves. A Realtor or mortgage lender can help you get a rough estimate as to how much you can anticipate these costs to be. Next, check your credit score. The better your credit score, the better interest rates you can recieve. Make sure that you are up to date on your balances and you continue to make your payments on time. Once you decide to start shopping for a new lender, do not open any new lines of credit or make any new large purchases on credit, such as a new car. In fact, do not do any of these things once you have your pre-approval letter, either. Any changes to your credit and available income can significantly affect your mortgage approval. The mortgage process does not end when you have your pre-approval, your credit and debt-to-ratio income will be reevaluated when you submit your offer to purchase to your lender. Now, you are ready to start shopping Mortgage lenders and get a pre-approval letter. I suggest shopping multiple lenders to find the best interest rate. Most pre-approval letters are good for 60-90 days. It will detail the loan amount and sales price the you qualify for, the financing type, such as conventional or government-insured. It may detail the loan arrangement that you have chosen, such as a 20-year fixed rate loan and the interest rate. Sometimes there may also be a few conditions needed to be met to obtain a final loan approval, such as property title information, a satisfactory appraisal and a specific amount of your down payment. Again, once you have your pre-approval do not make any big purchases or open any new lines of credit. You are now ready to start shopping for your new home! Make a checklist of all of the must haves you need in your home. Such as: how big? How many bedrooms? Do you need an office space? Do you need a workshop? Where is the location that is ideal for you? Do you want a short commute to work? Do you want your children to attend a certain school? Do you want to live in the metro area of your city or would you like to have closer access to outdoor recreation? Then, make a list of amenities you would like to have and prioritize them. Do you want a brick or concrete house? Do you want to have marble countertops? Covered Patio? Ceramic Floors? Which of these can you live without if you had everything you wanted in your home? This will make the shopping process easier when you can narrow down your needs and keeps you from being bedazzled with a small amenity in a home that ultimately doesn’t fit your needs. Once you know the type of home you are looking for and an idea of the location, seek out assistance in finding your new home from a Realtor. Titles can often be confusing by people who don’t know any better and the terms real estate agent, real estate broker and Realtor. So let’s clear up the confusion from the get-go. A real estate agent is anyone who’s taken some basic training classes and then has applied for, and passed, a state licensing exam. They’re also required to take a set number of hours of continuing education courses in order to renew their license periodically. A real estate broker, on the other hand, is required to take an additional number of classes in various subjects in order to qualify to sit for the broker’s license exam. Unlike a sales agent, brokers can open their own office and sell real estate without affiliating with anyone else. Brokers must also take continuing education courses in order to keep their license active. Now, you are on the road, looking at houses. To keep track of what houses you see and what features they have, take notes and take good pictures. After a while you will start forget which houses had which amenities and features. While you are looking at houses take note of the condition of the home. Are there water marks or warping on the ceiling? Can you open all the windows? Are faucets leaking? Does the toilet function properly? Are the cabinets under the sink free of mildew? Is there evidence of water damage or leaks? Are the electrical, plumbing, heating a cooling systems up to date? Take note outside, are there tree branches touching the roof or gutter? Do you notice cracks in the side of the house? Once you have narrowed down your choices, visit the neighborhood on the weekend and at night. This is when everyone is home and you can get a feel for what the neighborhood and your street will be like when it is busy. Test your commute to work and determine your travel time and traffic. Now that you have made your choice, tell your Realtor that you would like to make an offer on the home and any contingencies you may want to include such as an inspection period or opting out if you are not approved with your lender. When your offer is accepted schedule your inspection right away. A home inspection, in my opinion, is one of the most important steps in your home buying process. A professional home inspector is licensed by the state and has the knowledge necessary to determine the condition of the major components in your home. It is not a guarantee that nothing will break and sometimes there are things that just can not be visualized but it will help you to determine any concerns present and if you want to move forward knowing there will be certain repairs needed. The buyer incurs the expense of a home inspection and they are generally under $500, but the information provided in their report provided to you is invaluable and definitely worth the investment. Make your final walk through to ensure that everything is in the same condition and working order as it was during the inspection. Then, you get to move to closing. Closing is your final step in the home buying process. ‘This is when property ownership is transferred from the seller to you. All funds are distributed by the escrow company, and the new deed is registered in the buyer’s name. You will be made aware of all the fees for the mortgage, title transfer fees, taxes and other costs accumulated along the way. The Title company will inform you on how to pay these costs a few days prior to closing. You will and the seller will have documents to sign and there will be a distribution of funds on closing day. You will receive the keys to your new house and then the transaction will be complete. Buying a home is a big financial decision and one of the biggest purchases and investments we make. Being prepared is the first step and take your time on making your decision.